The battle for Immigration Reform and meaningful Border Security enhancements wages on in the U.S. Senate today. This afternoon, the Senate will have a cloture vote on the Corker-Hoeven Amendment designed to guarantee tangible, measurable increases to our border security systems before any immigration reform green-cards can be issued to immigrants who might earn temporary legal residency under the proposed Gang of Eight immigration bill. Both Texas Senators, Cornyn and Cruz, are expected to vote against the amendment. Senator Cornyn said today in a statement, "Unfortunately this measure still omits a real trigger or objective measure to see if the proposed strategy is working. At a time when the trust deficit with the federal government is so huge, we do not need more promises from the government - we need measurable results." Senator Cornyn's "RESULTS" amendment was tabled during debate last week. Senator Bob Corker (R-TN) believes his amendment provides measurable and achievable results that control actions being taken by the federal government to increase border security. An unprecedented surge of an additional 20,000 Border Patrol agents are deployed, maintained and stationed along the southern border, more than doubling the current force. The Comprehensive Southern Border Security Strategy is deployed and operational, which includes, at a minimum, full implementation and activation of the $4.5 billion in specific technology and equipment requested by the Border Patrol to achieve full surveillance of the border. The mandated electronic visa entry/exit system has been fully implemented at all air and sea ports of entry where U.S. Customs and Border Protection officers are currently deployed, which will improve the identification of those who overstay their visas. E-Verify is being used by all employers in the country, making it virtually impossible to work in the United States illegally. Sen. Corker said his amendment would also mandate the initiation of removal proceedings for at least 90% of illegal immigrants who are unlawfully present because of visa overstays. This accounts for about 40% of the illegal immigrant population. MYTH: Hoeven-Corker grants instant amnesty. FACT: In order to adjust to lawful RPI status, unlawful immigrants would be required to pay a fine, pass criminal and national security background checks, and start paying taxes. Only after ALL FIVE “triggers” of the Hoeven-Corker Amendment have been fully implemented AND at least 10 YEARS have passed can RPIs apply for a green card. MYTH: Hoeven-Corker is 1,200 pages that nobody has read. Nobody knows what’s in it. FACT: The notion that there are 1,200 NEW pages is very misleading. The tough border and interior enforcement provisions of Hoeven-Corker make up 119 pages added to the 1,100 that have been public since May. Also, most of the text aside from the border security improvements was from already filed and publicly available amendments. Since Friday, all members have had the text of the amendment and will have more than 72 hours to read and review the proposal before any votes. It’s not complicated: 20,000 Border Patrol agents, 700 miles of fence, 90% of overstays, and no abuse of federal benefits. MYTH: The amendment does not actually require 700 miles of fence before RPIs can receive green cards. 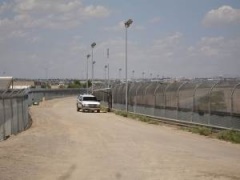 FACT: Section 3 of the Hoeven-Corker amendment makes it clear that before RPIs can adjust to lawful permanent resident status, the Southern Border Fencing Strategy must be implemented, putting in place “no fewer than 700 miles of pedestrian fencing.” The limitation in Section 5 states that DHS has some discretion in WHERE the fencing gets constructed as it drafts its strategy. Section 5 does not reference and therefore does not limit the requirements in Section 3 to establish 700 miles of pedestrian fencing before RPIs can apply for a green card. MYTH: The amendment puts the American taxpayer on the hook for $38 billion. FACT: CBO says the underlying immigration bill would reduce the deficit by $197 billion in the next 10 years and by $690 billion during the second decade. The total cost of security measures added by the Hoeven-Corker amendment is $38 billion. The base bill designates $8 billion to security measures, bringing the total cost of security measures for the bill, as amended, to $46 billion. The U.S. taxpayer will more than be made whole with the visa fees and by the $459 billion in additional tax revenue that result in the large deficit reduction. MYTH: The amendment is only about the border and does nothing to address the visa overstay issue. FACT: Visa overstays currently account for 40% of those unlawfully present in our country. This problem goes largely unaddressed because individuals identified as unlawfully present are not systematically removed. The administration has not considered their removal a priority, and in many cases, has established policies to delay their removal. The underlying bill improves the identification of overstays through a fully implemented entry/exit system. The Hoeven-Corker amendment goes a step further by mandating the initiation of removal proceedings for at least 90% of visa overstays – holding DHS accountable for failing to enforce the law and targeting an issue that is at the core of a policy of de facto amnesty. The amendment also requires extensive reporting to Congress every six months to facilitate oversight of the overstay issue. MYTH: Section 2302 says if you overstay your visa in the future you can still apply for a green card and become a citizen. FACT: That is a tortured and deliberately misleading reading of the amendment. This provision ONLY applies to Track Two of the new Merit-Based green card program which requires a person to have been LAWFULLY present in the U.S. for 10 CONSECUTIVE YEARS in an employment authorized status and then down the road it becomes 20 consecutive years. This provision was intended to apply to persons currently in the United States in the lawful status known as Temporary Protected Status (TPS) - a status granted to eligible nationals of certain countries who are already in the United States and cannot return to their country due to conditions such as an environmental disaster or humanitarian crisis – who may have previously overstayed their visa prior to having been granted TPS. MYTH: The 20,000 additional Border Patrol agents won’t begin to be deployed until 2017. FACT: The only reference in the bill to the year 2017, as it relates to the deployment of border security resources, is in reference to a mandate on DHS that says the 3,500 Customs and Border Protection officers they are required to deploy for points of entry MUST BE HIRED by 2017. This is a positive provision that will ensure additional CBP officers are in place as quickly as possible, and in no way delays the deployment of the additional 20,000 Border Patrol agents. Under Hoeven-Corker, the Border Patrol must deploy 20,000 additional agents before RPIs can adjust to a green card. There will be no time to waste. After today's cloture vote, assuming its passage, their will be closing debates, a few more "germane" amendments and then a final vote on the bill is expected on Thursday or Friday. The House of Representatives is hard at work on their own versions of border security enhancements and immigration reform. TexasGOVote will cover the progress on those bills in-depth next week.